Sorry I didn't post anything over the weekend, it's been a busy few days! One thing I was going to bring to everyone's attention was a change in wildlife I've seen this summer. Normally we have lots of swallows around us, specifically violet-greens (what ornithologists call VGs). These are darling little birds that swoop and chirp and often nest in the eaves of the barn. But this year for the first time we've had a different kind of swallow. Unlike the chirping sound of the VGs, these swallows make a raspy sound, what my bird book describes as "creaking notes and guttural gratings." Not unpleasant, just harsher than the VGs. 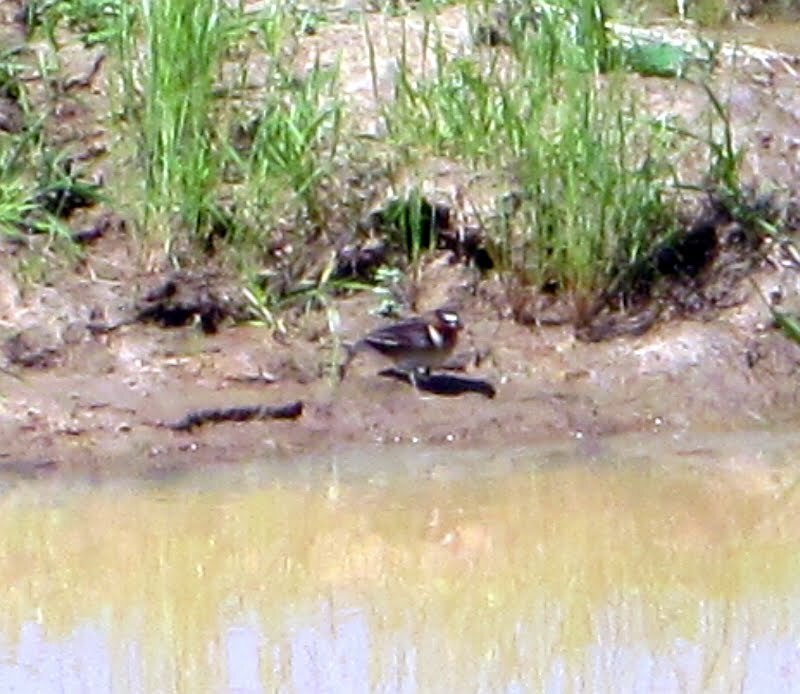 I didn't know what these were at first until I identified them as cliff swallows. 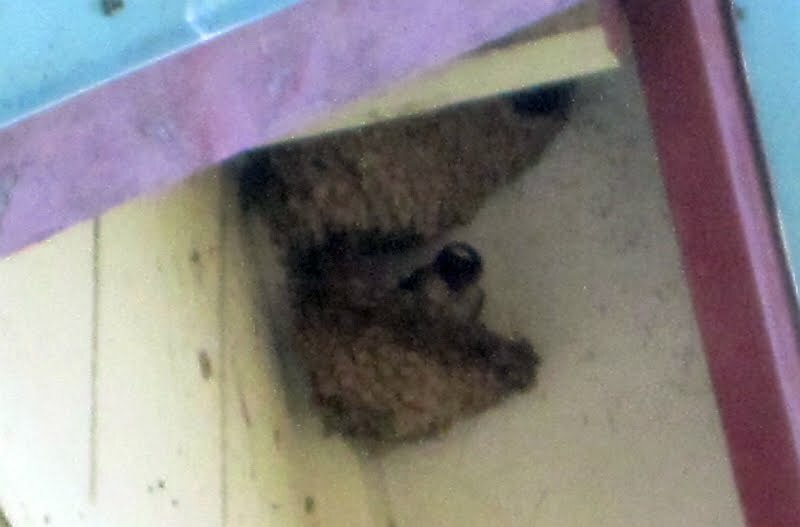 They were particularly easy to identify after they started nesting in the eaves of the house, right above our bedroom window. But the question arose, why now? Why all of a sudden would we have cliff swallows around our house when we never had them before? 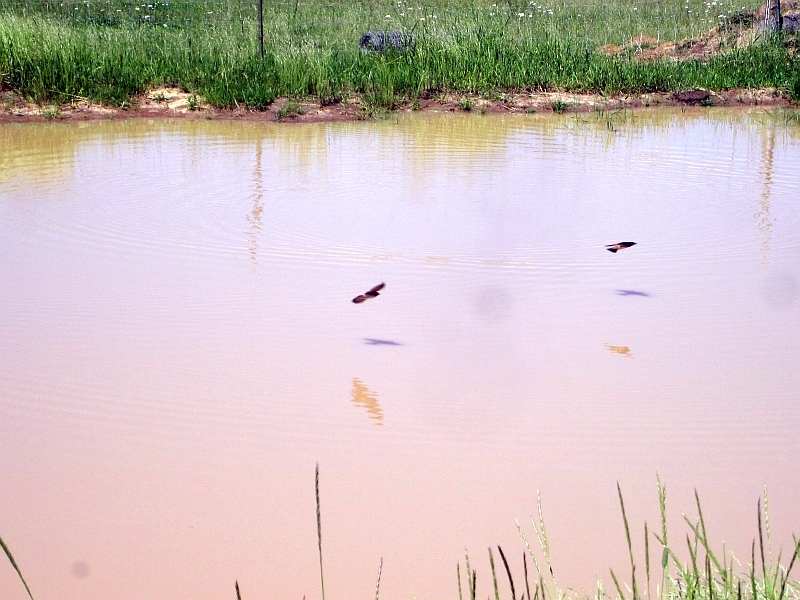 The answer, rather surprisingly, is the pond. 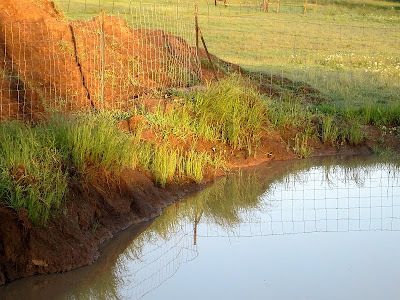 When we had the pond dug last winter, we had no way of anticipating that open water would alter the balance of wildlife. Not altering it badly (I don't think a pond is bad), just... altering. 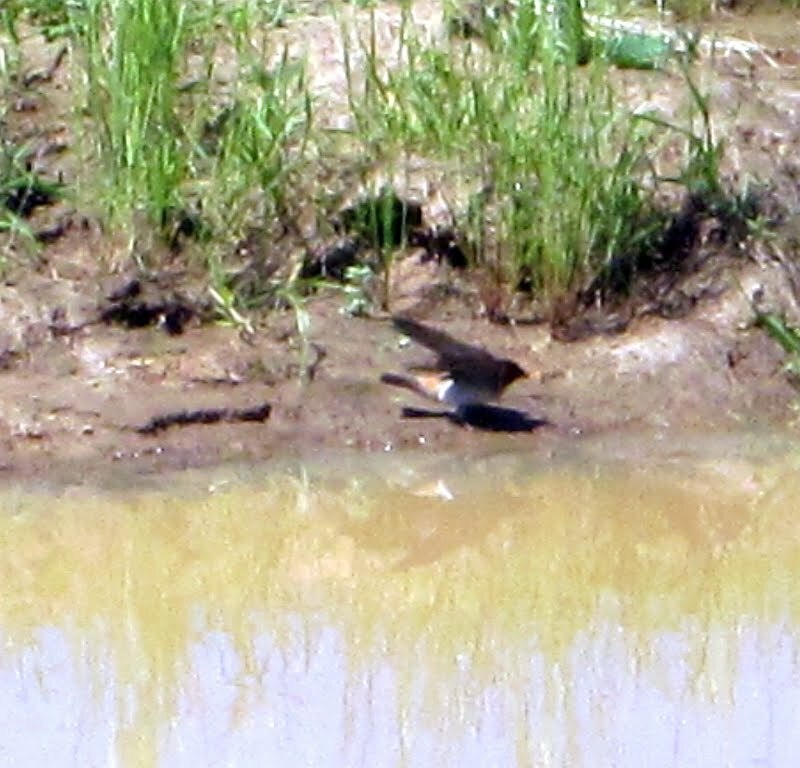 You see, what the pond gives cliff swallows is a source of mud, which is how they build their homes. No mud, no homes. 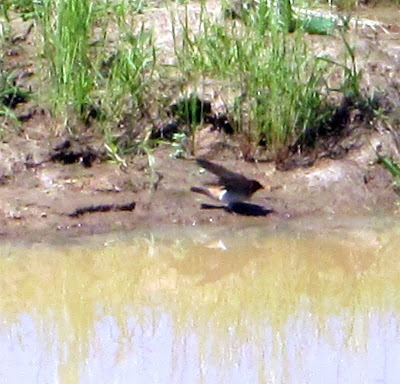 Cliff swallows don't just harvest mud, they skim low over the water and snag either a drink, or to gather water to make the mud more pliable (or both). It's neat to watch this in action. 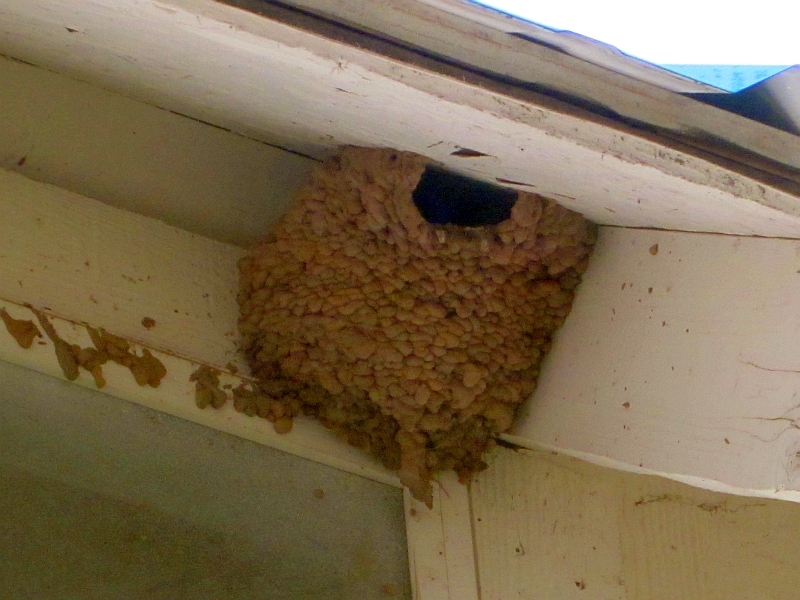 The result of all this activity, of course, is swallow condos. I'm aware this can become a problem. Part of me likes having our house be a bird sanctuary; but there's no question they're noisy, messy, and could potentially build their condos so thick as to become urban blight under our eaves. So... for the time being, we'll leave them alone. 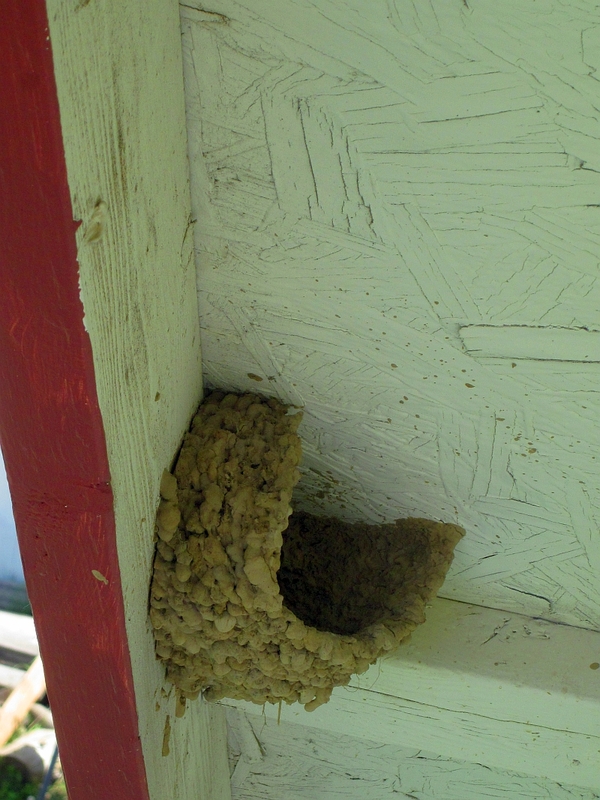 (We wouldn't disturb nesting birds anyway.) 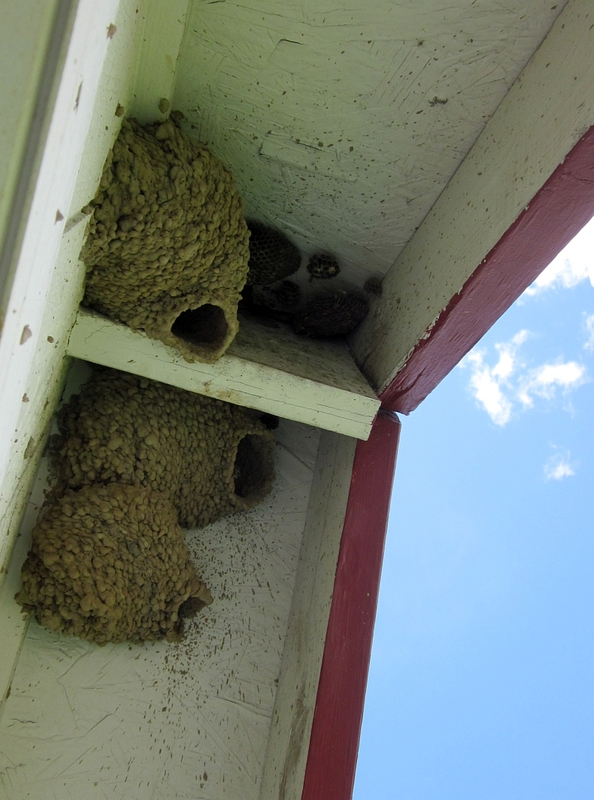 In the fall, we'll knock down their nests and let them rebuild fresh in the spring. We'll repeat this cycle every year. This way we can keep the condos under control... sort of. Love having birds around! You had a good idea to knock the nests down in the fall. They will come back next year. 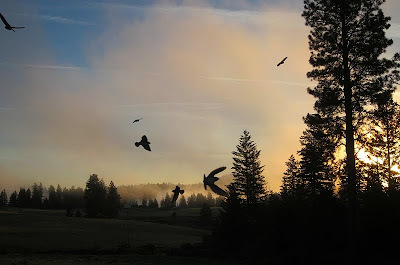 We have Turkey Vultures roosting here every night. These birds are just wonderful to watch as they glide, weaving their way in and out of the branches. They don't 'squee' like an eagle but make grunting sounds. Believe it or not, I can tell the difference between some of the birds. One night we had 28 of them roosting! I miss our swallows. They used to build their mud nests under our eves too, but then the starlings got so thick around here that I think they have pushed out the swallows. 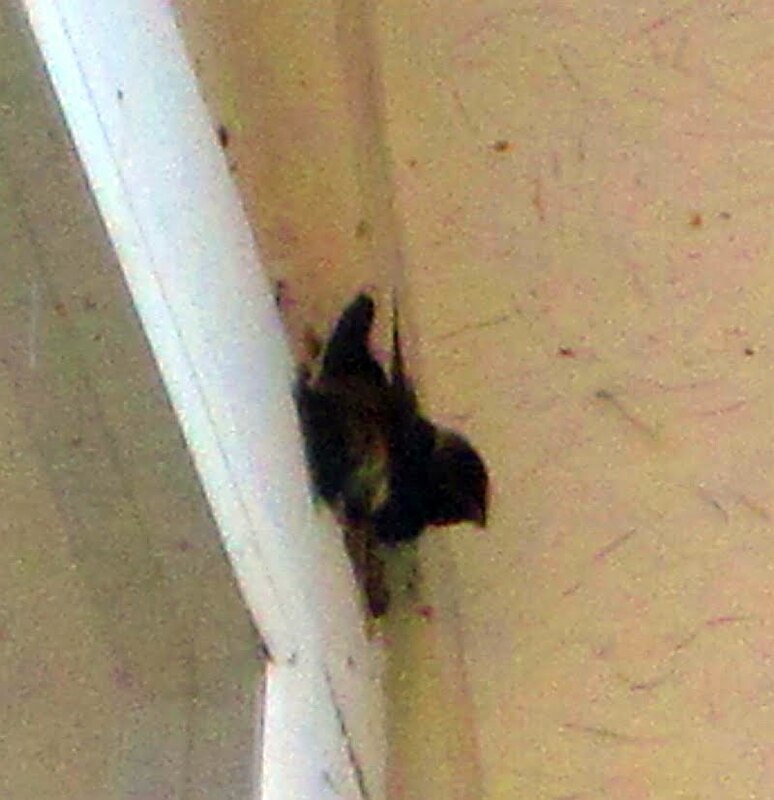 I have seen 3 or 4 swallows this year and don't know where their nest is. They are not annoying pests like starlings. lol i think i would rather have your birds than the flying squirrels that try to nest in our eaves any day! and my mother, bless her heart, would be happy to give you all the pigeons that nest on her roof and window sills at her apartment bldg. That's a fantastic silhouette you've chosen as your blog photo. I just LOVE it. Thanks. It was just after dawn (about 5:15 am) and as I got up, I noticed a shape in the neighbor's field across from us. Fearing that it was one of our cows who had escaped, I peered through binoculars... and saw a doe with a newborn fawn. I dashed downstairs for the camera and then up to the loft (which has a window right under the eaves), but I was too late -- the doe was heading out of sight. 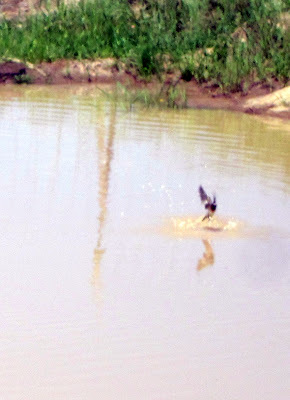 But in the process I disturbed all the swallows, and they flew about in agitation. That's when I got the photo. About half-way between Colorado Springs and Denver is a single-lane underpass that goes under Interstate 25 at a "ranch exit". The concrete Walls and ceiling is LINED with swallow nests. It's fun to pull off the highway and take a detour through the tunnel! There must be a thousand or so swallows. 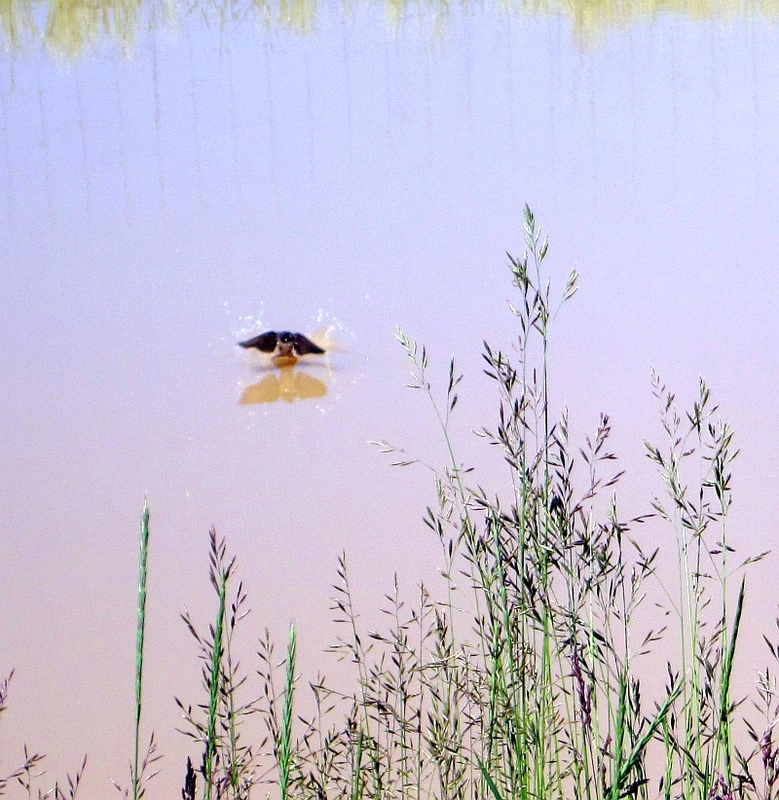 There's a marsh nearby that the birds get the mud from. I love observing swallows! There's a "ranch exit" with a single-lane underpass about 1/2 way between Denver and Colorado Springs. If I'm not in a hurry, I like to pull off and run through the concrete tunnel. There must be a thousand or so birds. 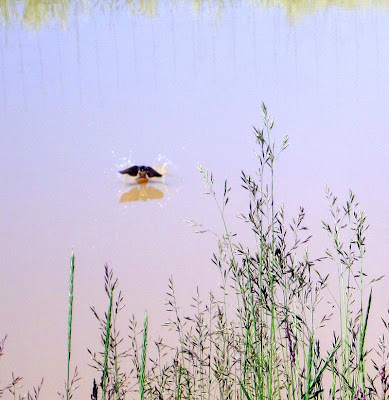 There's a marsh very close that supplies their mud. As Mr. Spock (from Star Trek) would say: "Fascinating!" 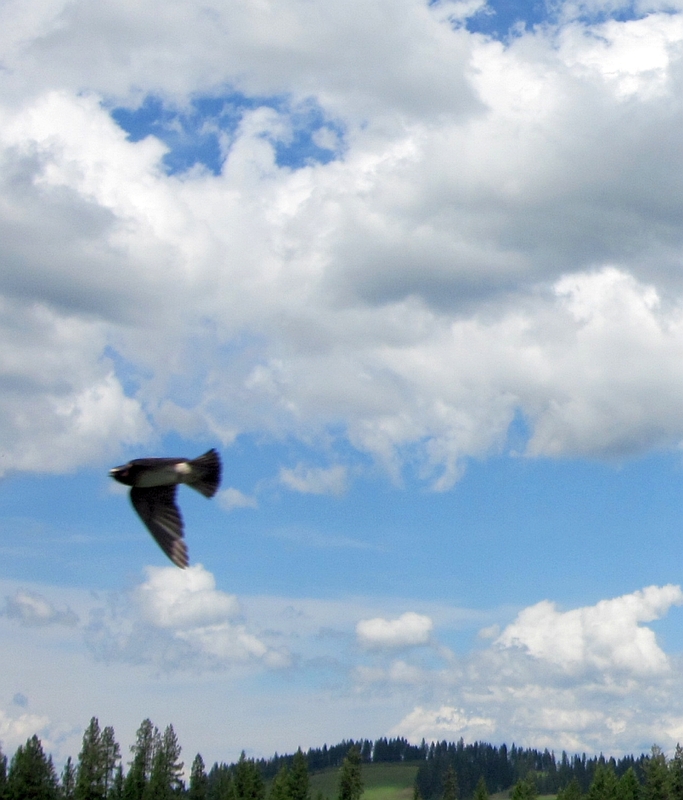 I am truly fascinated by what I've learned about swallows in this post! We have chimney swifts (distant cousins, I expect, to your cliff swallows) who use similar nests. They nest inside the corners of our porch roof. 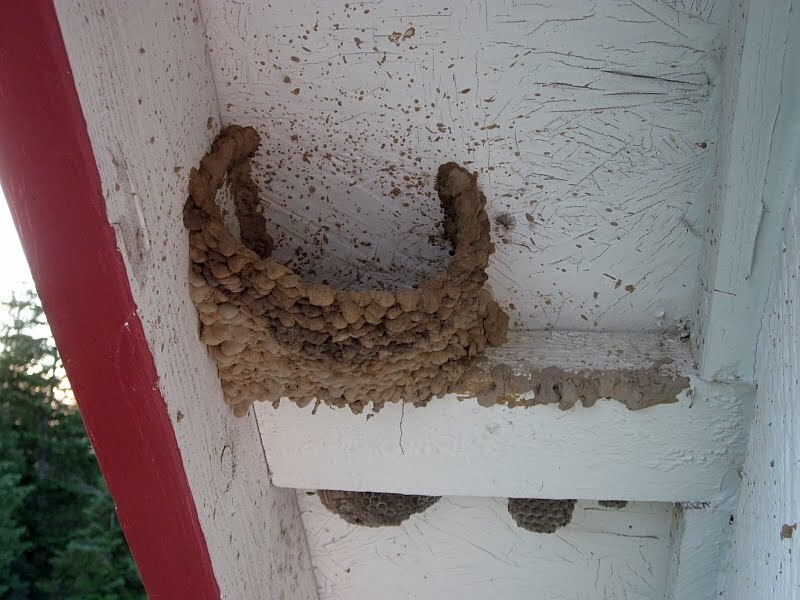 We find they do not build new nests each year, but re-use the same two nests. Last year, there was a HUGE territorial dispute, resulting in some eggs being tossed out of a nest (I was stunned at just how mean those little darlings could be!). In the end, no one used that nest. 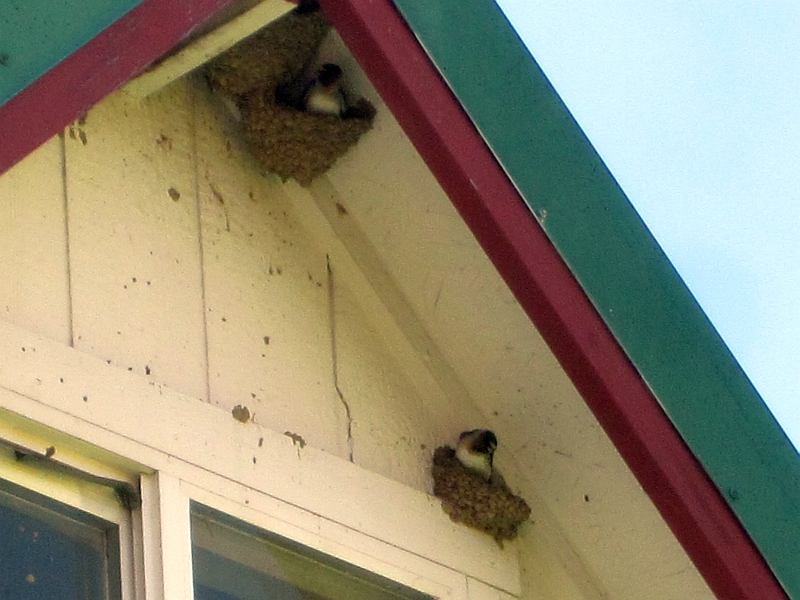 Instead, one parent pair built a new, temporary nest, which, this year, they are all studiously ignoring. 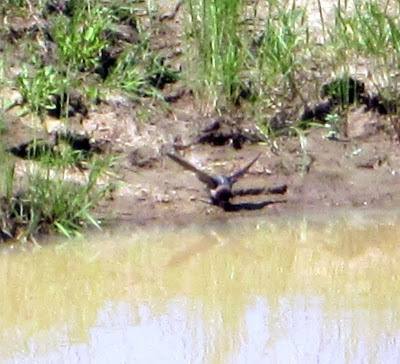 Anyway, in general, the two nests are each home to about two clutches each year. And while they *can* be messy, I think it is well worth scrubbing the parts of the porch under the nests a couple times a year in return for the thousands and thousands of mosquitoes the birds consume. 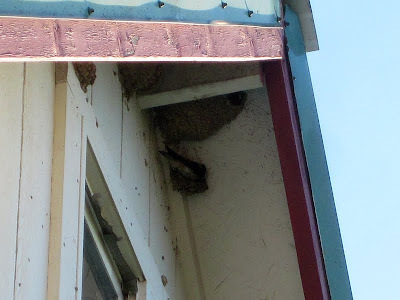 Plus, there's just something sweet about a bunch of baby birds leaning their heads over the edge of their nest so they can watch us and listen while we're outside on the porch reading aloud. Wonderful photos! We have a pond and have one pair of barn swallows that is determined to build a nest on our front porch. 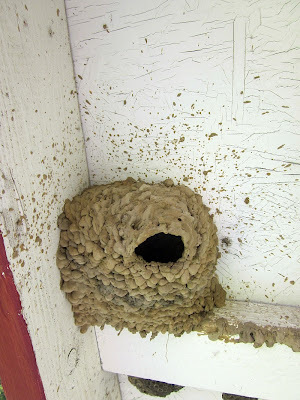 We have a battle every spring where they start to build a nest and we knock it down. We have a metal carport and a nice pole barn that we would be happy to have them build in. The first year they had already laid eggs so we had to let them stay until the youngsters go to flying age. They are very persistent!